Coffee cookies. My ultimate favourite cookie ever. 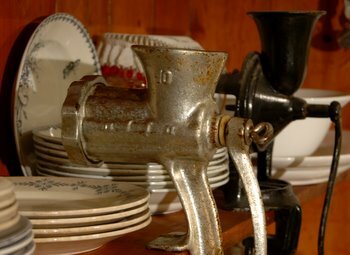 And a reminder of my mother and my childhood in the kitchen. And probably the strongest reminder of my mother’s constant quest for excellence. Which brings me to this writing. Not to be mistaken with doing something better than someone else, or doing it according to the standards of someone else, but to set your own standards and strive to give and do your own best. To put love into whatever you take on. To go to bed at night, knowing that you gave your best. Whether you’re ironing a shirt, or writing a book, or playing a tennismatch, or preparing a sandwich, or baking a coffee cookie; the best is, you not comprimising for second best. I can’t put a coffee cookie in my mouth, be it my own or baked by another hand, without thinking of this philosophy stemming from my childhood and following me to where I am today. Her coffee cookies had to be perfect in colour and length, the tops had to have perfect little “spikes” and never were they to be flat and fat and run-out in the pan, which of course goes all the way back to the preparation of your dough. Those cookies, not reaching all of these criteria, would be put aside never to see the cakestand. And that would mean another batch to be prepared to reach the desired quota. To stack the cake stand with pride. I have not only inherited her recipe, but also her strive for excellence. I have passed it on to my daughters. And from the heart they put into their ordinary and sometimes mundane tasks, I know they’ll pass it on too. Maybe that is why I still enjoy baking these coffee cookies… a reminder, a question to myself: Do I still give all of my heart and all of my love to do what I do well? Mix the flour, salt and sugar in a big mixing bowl. Add the butter and fat and work into the flour until the mixture resembles breadcrumbs. Mix the baking soda with a little coffee and add to the flour mixture with the rest of the coffee, the golden syrup and the vanilla extract. Mix together well, cover and leave overnight. The next day: Set the oven to 200ºC. Grease cookie pans and set aside. Using a sausage maker/meat grinder/electrical food grinder/cookie maker with a cookie fitting, push clumps of dough through the cookiemaker, cut to the desired lenghts, about 4-5 cm. The dough can also be rolled, cut into strips of about 4-5 cm, with the tops lightly scrathed with a fork to give it some texture. Place the cookies on a baking sheet and bake for about 12 minutes until golden brown. Leave the cookies on a wire rack to cool. Filling: Mix together 2 heaped tablespoons of butter. Add icing sugar, strong black coffee and vanilla extract and mix until a spreadable, but not runny consistency. Spread one side of a cookie with the icing mixture and cover with a second cookie. The longer the cookies are kept, the more flavourful they become. *I post all my recipes for that matter, hoping to inspire people to experiment themselves and play around with their imagination when it comes to detail. I’m never too specific, because I would like to encourage people to cook with their tastebuds and instinct and imagination, tasting along the way, changing direction, altering the recipe, really discovering your own methods rather than just following a recipe to the letter. That way, you develop an instinct for cooking and you really make a recipe your own, otherwise it will always stay someone else’s. Coming back to the length and shape of these cookies: When working with a cookie maker of some sort, it comes out a certain thickness and you just have to decide on your desired length, which I suggested be 4-5 cm(1.6-2″), but it can surely be longer or shorter. By pushing the dough thicker out the end, will result in a thicker cookie. A tip: I also always find it wise to put only a few cookies in the oven as the first batch, whichever cookie I’m baking, so as to decide whether I like the thickness or the length or the shape, or test the temperature of my own oven, the time of baking etc, and then I will go over to the final process of cutting and baking in normal big batches. It prevents huge batches of burnt or uneven baked or failed cookies and lost effort and disappointment. Suggestion 1: If you are rolling out the dough, I would suggest a thickness of about 4-5 mm. (about 0.2″) Cut them into rectangles of about 50mm x20mm (2″ x 0.8″). Scratch the tops with a fork to give little ruffled edge, like you would get with a sausage maker or cookie maker. Suggestion 2: On 2 tablespoons of butter, add 1/2 cup icing sugar and mix. Add about 30 ml of black coffee to the icing mixture and mix. Finally add another 1/2 cup icing sugar or until you have a spreadable filling that isn’t runny. Add a teaspoon of vanilla essence and spread between two cookies. Milk can be substituted for the coffee. This is an entry for Apples and Thyme, of which Inge at Vanielje kitchen and Jeni at the Passionate palate are the hosts. And they do look perfect! I love the ‘spikes’ on top of the cookies, nice colour as well. What a lovely post. Lovely. The cookies look beautiful and so does the photo! Oh my, but these look so delicious. And the “spikes” are amazing. How did you get them all so perfect? Ronell, those are gorgeous cookies and I wholeheartedly approve of your mom’s philosphy. It’s just about the most important thing you can pass on to your children. Try your best. YOUR best, not anyone elses. Thank you for this lovely post. Wonderful read. And not to mention the coffee cookies. The last picture isb’t it a hand machine to make mince meat. When i was a young girl my mom also had them. Wow those cookies look really great! I love the spikes. The fact that it uses 8 cups of flour is a little daunting though. I love your posts , Ronell. Coffee IN cookies? It doesn’t get much better. This was a lovely post. I remember my grandma making coffee cookies for church bazaars when I was a kid. I always ate most of the dough coming out of the grinder though, so not much was left for the bazaar. Yum! Just kidding, I LOVE you blog. I just love coffee. And cookies. I shall have to make these! The looks of them remind me of taffy cookies that my mother adored. Wow what a gorgeous basket of cookies. They make me want to make a coffee right now. What a find your blog is also, with not only your gorgeous food, but your wonderful paintings. Truly inspiring. Ronell – this is a beautiful post and picture-perfect looking cookies! I have never heard of these cookies before but think I should be trying them soon. Thanks for this lovely entry. Oh, how lovely and delicious-sounding!! I’m going to make these! Also my absolute favourite! Takes me back to my Ouma’s kitchen – lots of happy memories. 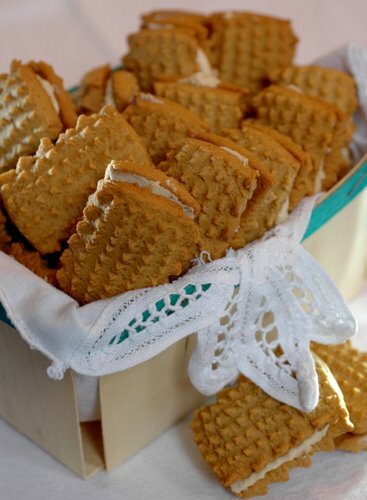 These look like a wonderful cookie….great photo. Thank you for visiting Katie..and happy to hear that these cookies make you think of your grandmother! I can imagine how beautiful(and delicious) the Spritz cookies must’ve looked with the sprinkles.